UPDATE: Julie Zickefoose has a new, improved bluebird dough. Learn about the nutrition issues on her blog.. Most birds that winter in northern climates are adherents of the Atkin’s diet—that is, they thrive on low-carbohydrate diets that are heavy in fats and proteins. Those of us concerned about clogged arteries may find it hard to believe, but unadulterated animal fat is actually a healthy food for many birds. The term suet technically refers to the hard, fatty tissue around the kidneys of cattle and sheep, used in cooking and for making tallow. However, many people use the word to refer to any fat trimmings from beef. Either way, it’s very popular with many backyard birds, especially woodpeckers, chickadees, nuthatches, jays, catbirds, orioles, and starlings. Over the years, I’ve had four species of warblers at my suet feeders. 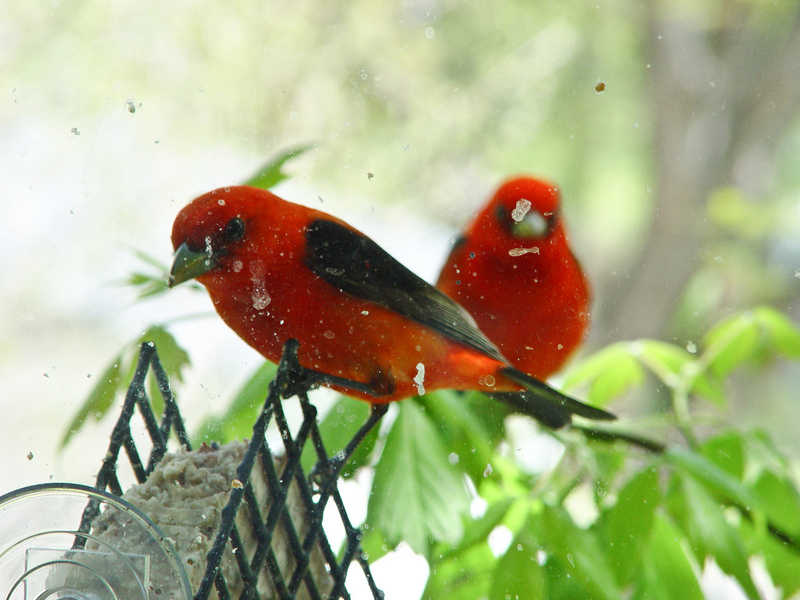 Tanagers also occasionally visit suet feeders, especially during spring migration. 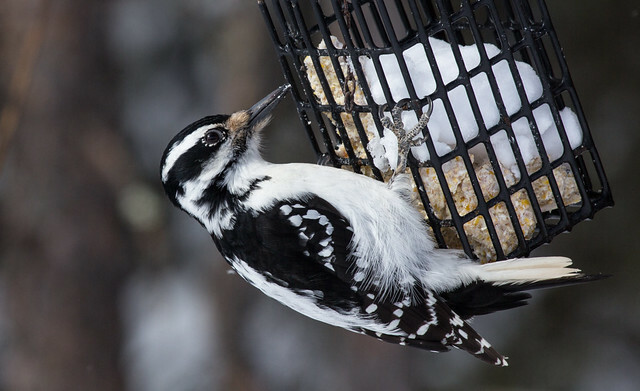 Suet can be fed to birds raw (as it comes from the grocery store) or rendered—melted down, usually in a double boiler, and then strained. Rendered suet can be poured into cupcake papers, aluminum foil cake pans, or similar molds and then chilled. Rendered suet stays fresh and solid much longer than raw suet; in warm weather, raw suet quickly becomes rancid. There are many recipes for making more complicated suet cakes, available in bird feeding books. Several varieties of commercial suet cakes are available; some even contain dried insects or fruits in addition to rendered suet. Commercial suet cakes are especially good to use in summer because they stay fresh for a long time. Suet, either raw chunks or prepared cakes, is usually offered to birds in suet cages. These can be bought from bird feeding stores or made from plastic-coated wide-weave metal mesh or hardware cloth. Suet can also be smeared directly onto tree bark or stuck into the crevices of pinecones that are then hung from tree branches. A teacher in my area once had a Red-breasted Nuthatch die after becoming entangled in an onion bag holding suet, so I no longer recommend using mesh bags. Some people are concerned that metal suet cages might pose a danger in extreme cold. I’ve never heard firsthand of any birds injured by getting stuck to cold metal, but to be safe, I always buy plastic-coated suet cages. Hunters often tie venison rib cages to the trunk of a tree, where birds can pick at the fat and peck into the bone for weeks. 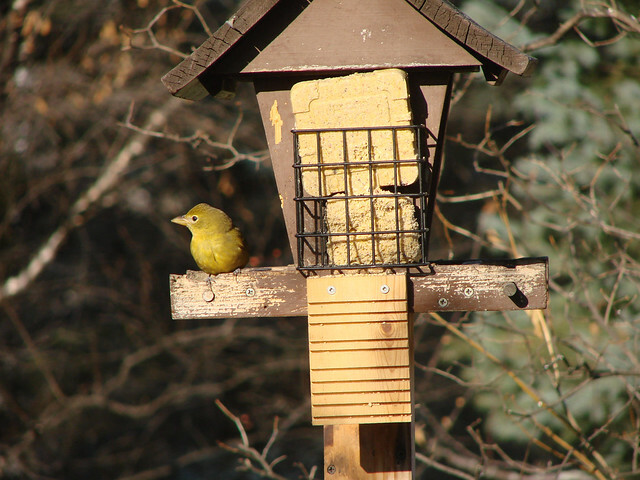 It may be important to consider your neighbor’s view when figuring out where to place such a treat, but it provides high-quality food for birds. Make sure that no buckshot or bullet fragments remain. People used to set out congealed bacon fat and other drippings for birds. Although birds seem to relish the flavor, and although the fat is good for the, it’s risky to offer bacon or other processed meats to birds. Sodium nitrates are harmful to humans, so they are almost certainly harmful to birds. Should you feed suet to birds in summer? They don’t need it when insects are available, but adult chickadees and woodpeckers often take quick meals at feeders to sustain their energy levels as they bring the majority of the insects they catch to their nestlings. And when baby woodpeckers and orioles fledge, the parents frequently bring them to feeders, providing us with a lovely sight and a firsthand view of how successful nesting has been that season. But soft suet can make a bird’s belly or facial feathers sticky, reducing their insulating and waterproofing ability. 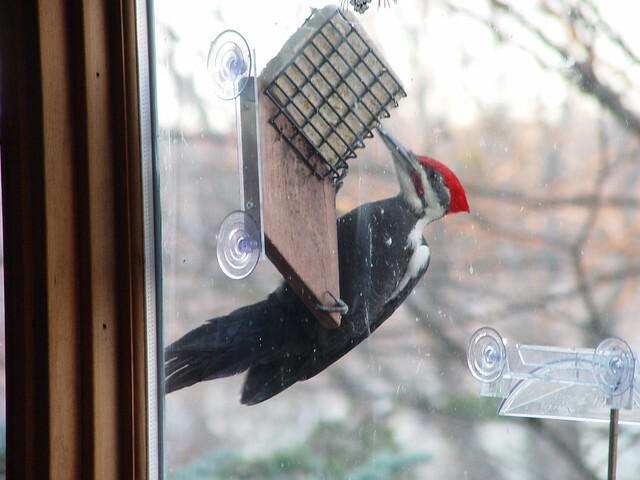 There are even reports of woodpeckers losing all the feathers on their faces after feeding at goopy suet. Rancid suet can also harbor dangerous bacteria. Make sure to set out only rendered or commercially prepared suet cakes in warm weather. As fun as it is to see them, I don’t like the idea of offering suet to attract fledglings, because growing birds need more protein than fat in their diets.